My word of the year, PLANTED from Psalm 1:3, never seems to escape me. The image of a tree being deeply rooted, supported and held upright by God alone is so encouraging in a season of change. This month is a big month for our family. We have a PCS coming up soon. Whenever we move, I feel a certain sense of excitement, but also sadness, for what we're leaving behind. Once again, we're leaving behind a church family, a house that we've made into a home, and countless memories. Once again we've run out of time to do all the things we planned to do. Once again, we're packing up our house, taking down pictures, sorting through what we need or don't need, stuffing others things away to sort through at a later date. I'm spending extra moments cleaning baseboard, putting some shine back on the kitchen cabinets, starting a pile of things we want to pack in our cars. Overall, our kids seem really excited about this move. It's mostly me that feels the sadness over a season that's about to close. But haven't we all felt that sadness at times? Graduating college, saying goodbye to friends, finishing up a job, realizing your little one can no longer be classified as "baby." There's a certain joy over what lies ahead, while at the same time, an ache deep in your chest remains. Where shall I go from your Spirit? These precious words were such a sweet reminder of God's guiding hand. Friends, we can't move anywhere in this world without Him by our side. Even the ends of the earth are within His grasp. We can't escape Him (not that I want to). He will always be there, holding on to us ever step of the way. Some days in the military feel like a wondrous adventure, others are downright hard. But He's got us. Each and everyone of us. Any change you may be facing in this world, any bittersweet ending, any scary new beginning, God is there, holding on fast. He's not letting go, which is so wondrous, so precious. And He's with my loved one as well. The people I'm sad to leave behind with each move, the sweet people who have forever changed my heart, He's got them to. And so, although my heart squeezes painfully at times, I praise my Savior for the road He's taken me on so far, and praise Him for what lies up ahead. Oh the blessings I've experienced, and oh the exciting new adventure that's about to begin! "But who are you, a mere man, to talk back to God? Will what is formed say to the one who formed it, 'Why did you make me like this?” Or has the potter no right over the clay, to make from the same lump one piece of pottery for honor and another for dishonor?" (Romans 9:20-21, HCSB). The imagery of a potter and his clay has long struck me. He created us with a distinct purpose. Both our outward appearance and inward traits are unique, our own, and so beautiful. We are no mistake. He breathed life into us, knowing every day that we would live upon this earth, "before one of them came to be" (Psalm 139:16, NIV). 'I will call Not My People, My People, and she who is Unloved, Beloved. And it will be in the place where they were told,you are not My people, there they will be called sons of the living God'"(Romans 9:23-26, HCSB). Way back in Genesis, we read about God's great plan, how He promised to make an entire nation out of one man's descendants (Abraham). The Israelites have long been God's chosen people. Out of Abraham's line eventually came Jesus, who would bridge the gap for Jews and for Gentiles. The People who were not His people would have a way to become His people. They, too, would be called the sons of God. Jesus Christ bridged that gap, His death and resurrection made it possible for all of us to have eternal life. Not through any acts we have personally done, but through accepting the great price Jesus paid for all of us. I loved reading these verses from Romans this morning. It was such a great reminder of how intentional God is. He is the great Potter, who makes no mistakes when forming His clay. I have a specific reason for being here, my looks, my likes, my dislikes, my passions, the things I enjoy here on earth, are for a reason. He created me to serve Him. To bring glory to Him in everything. And through Christ, I, a Gentile, am a part of the Kingdom of God. Eternal life wasn't just for the Jewish nation, but for me, and you as well. There was always a plan, from the beginning. Isn't it nice knowing that God didn't make a mistake? He placed you here on earth, in the family you're in, with your strengths and weakness, for a very distinct purpose. Live in the freedom today. Live in that knowledge today. Be encouraged, friend. The Potter made something beautiful when He made you! Faith means believing in God's sovereignty. It means trusting He is on the throne, in command of all things, and working through every circumstance that comes our way. When we have that kind of faith, we have peace in the midst of trails. But when we forget God's soverienty, throubling circumstances cause us to despair. We survey the landscape with our eyes instead of with our faith" (Chuck Smith, Faith ,6). I'm having trouble letting go. Admitting that E isn't a tiny baby anymore. A friend suggested a Mom's Morning Out program to me several months ago. My brain has been filled with every reason that I shouldn't do it. I'm honestly scared to give her up for several hours each week. Eight hours, to be exact. But who knows. Who knows how God might be moving through this situation. It would certainly give us both a breather. Both a chance to regroup. 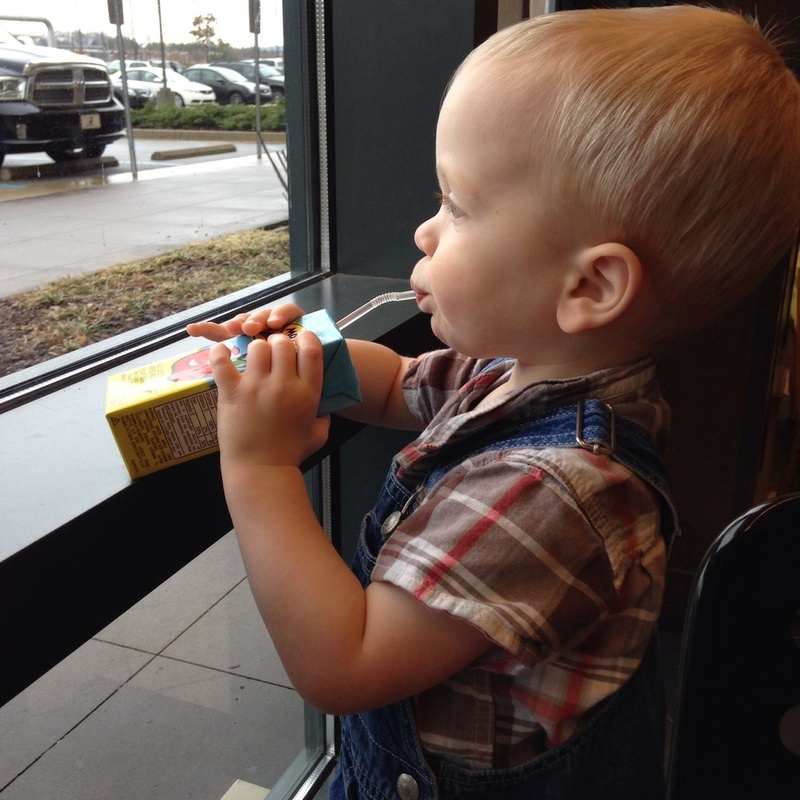 I could run errands with one kiddo instead of two, and probably find some hours to sit in a coffee shop as well. And she would be learning, growing, interacting. Forming friendships. Growing up. I worry about her sitting in classroom, having to pay attention to a teacher, using the potty when she needs to. But perhaps, it's exactly what she needs. It's crazy that I'm afraid about such a thing. But human. Natural. Often the way a mommy thinks. Who wants to let their little one go? For so long, they're our world. We often put dreams on the back burner to take care of these little fireballs. We watch wake up at all hours of the night to feed them, chase after them through grocery stores, keep harmful things out of their way. No wonder it's hard to start letting go. To admit that we've never really been in control. Didn't He create this very child? Psalm 139 tells us that He knew E before she even began. He, alone, knows the number of hairs upon her head. She is His precious creation. Is He not able to take care of her, today and everyday? All I do know is that the past 3 years have passed far to quickly for my liking. I can't imagine what the next 15 will feel like. I'm sure they'll go by faster than I want them too. I will have far more letting go to do. "Do not be anxious about anything, but in everything by prayer and supplication with thanksgiving let your requests be known to God. And the peach of God, which surpasses all understanding will guard your hearts and your minds in Christ Jesus" (Philippians 4:6-7, ESV). Dear Lord, guard my heart and mind today. Help me to not be much afraid, but to instead trust you with every aspect of this life you've given me. And do the same with my friends as well. Grant them peace and assurance that You are in control of all things. "Let me hear of your unfailing love each morning, for I am trusting you. Show me where to walk, for I give myself to you" (Psalm 143:8, NLT). My hours are long, at this point. Mornings come early, often before I'm ready to greet them. With a baby, and an early-bird toddler, I'm often up with the sun, fumbling for a cup of coffee to help jump-start my brain. But even then, I can praise. Praise Him for two beautiful, healthy children. Praise Him for a hard-working husband. Praise Him for all the little , everyday blessings in our lives. Praise Him that we've made it through this first month with a newborn in the house. Month! It's hard to believe that our little guy is already a month old. In some ways, things are easier this time around. We aren't quite so frazzled by the cries, and we definitely sleep deeper in between feedings. In other ways, it's harder. It's hard to find that new balance. That new way of getting everything done. It's hard to balance my time between not one, but two children. It's harder than ever to get out of the house. And it's hard being so far from those I love. Yesterday I was having a bought of loneliness. I was wishing that this military life wasn't what God had called us to. I really wanted to stop by and have tea with an old friend, or spend the afternoon at the beach with my mom. I wanted to have a game night with some pals, or swap babysitting with a play-group buddy. But, instead, I found myself sitting in a sandbox, playing with my little girl, soaking up the Alabama heat, and wishing I was somewhere less humid! My heart was aching from the miles that separate me from those I love most. And I was praying that this place will eventually feel like home. I know that God has brought us here. Looking back, I can see His continued hand on each part of our lives. But it doesn't mean moving is easy. It doesn't mean that I don't feel the pain and loneliness involed as we trapse back and forth across the country. But it does mean that I have a choice. Do I sit around, feeling sorry about my situation, or do I do something about it? Mind you, I'm limited in what I can do at the moment. With a one-month-old and a two-year-old, it is rather hard for me to be social :) But I can still reach out. I can still make an effort. And I can still be honest about these feelings to my Savior. Because He understands loneliness. He understands being separated from loved ones. And He has a plan. He always does. If He placed my family here for a reason, I know He will work. I know He will provide. Until then, I'm thankful for what I do have. I'm thankful for the blessing of friendships past and present in my life. I'm thankful for phone calls, letters, and social media that means I can stay in contact with those I hold dear. And I'm thankful that I've been fortunate enough to have relationships to miss. To have people I love enough that my heart hurts when they're far away. And so, in this early morning quiet time, I praise Him for all He is. And I thank Him for all of you. Oh how fortunate am I! We're getting closer and closer to moving day. Our green wall has been painted back to white. Pictures have been taken down. Piles of valuables are beginning to form. This house is looking less and less like "ours" and more like a convenient place to sleep. I go through ups and downs. Some moments I'm fine. Others, I start to panic over the long laundry list of "to-dos." But then, those rays of sunshine come in. A rare, heavy snowfall lands in our backyard. My little girl laughs hysterically as she plays with her papa in it. Things slowly get checked off our list. Friends invited us over to dinner and surprise us with a mini baby shower. We spend an evening laughing, eating Lasagna, salad, garlic bread and cake, and watching Disney movies with the kids. I come home with a small pile of onesies, hats and toys for the beloved little boy that will be in our life before I know it. And my heart feels completely full. The list of to-do’s doesn't seem so daunting. My heart feels blessed. Blessed to be loved. Blessed that God reaches into the smallest corners of my heart and reminds me often of His all encompassing love. Blessed that He cares about things big and small. No, He doesn’t fulfill every single desire. And I’m so glad He hasn’t! some of those roads would have led me to far different places. But I do believe He loves us. He wants to see us content and happy in this world. And He often finds ways, big and small to remind us of that love. I truly believe that God knew how much I needed some encouragement last night. How much I needed to focus on something besides this move. And so, He sent friends to love on me. He sent friends to remind me that I’m very much not alone. He gave me a blessing, and in return I praise Him for who He is! “May the Lord answer you when you are in distress; may the name of the God of Jacob protect you. May he send you help from the sanctuary and grant you support from Zion. May he remember all your sacrifices and accept your burnt offerings. May he give you the desire of your heart and make all your plans succeed" (Psalm 20:1-4, NIV). The Psalms are where my heart turned to this week. My devotional time has been sketchy, at best. The words of King David seemed the logical place to go to for some encouragement, and to start my day off on the right foot. I never get tired of the Psalms. There’s such a beautiful struggle that takes place there. The Psalmist faces so many temptations, battles, ups and downs. He’s unafraid to ask God to meet Him exactly where He’s at, day-in and day-out. My heart responds to such transparency. My heart loves reading of real people really struggling in this life. "You have put more joy in my heart than they have when their grain and new wine abound. I will both lie down and sleep in peace, for You alone, Lord, make me live in safety" (Psalm 4:7-8, HCSB). What a great reminder that each day we live is really not our own. We only wake because God has chosen to give us another day to live. Because He has an unfinished plan for us in this world. It certainly gives comfort in the face of unknowns. He protects, He keeps us safe, He knows the number of our days. Life is really out of our control in this regard. “At daybreak, Lord, You hear my voice; at daybreak I plead my case to You and watch expectantly” (Psalm 5:3, HCSB). I pour out my requests, my pleas, my worries to Jesus, knowing that He will provide in His timing. It’s so hard to give up the reigns, but so important. He will provide, in His own time. It’s frustrating when it’s not on my timetable, but He truly knows my heart. Why should I spend time worrying, when He has the details already worked out! “But I enter Your house by the abundance of Your faithful love; I bow down toward Your holy temple in reverential awe of You” (Psalm 5:7, HCSB). I loved the wording here. The “abundance” of God’s “faithful love.” It’s a large amount. It’s overflowing. It’s overpowering. It’s a love that surpasses my understanding. A love i truly don’t deserve. But He loves me anyway. And He loves you as well. Did you know that? Did you know how far His love for your stretches? In the face of such love, how can I fear? There really just isn’t room. His love is that amazing. I haven't really let myself think about it. I processed the information on the news today. I watched the footage of little elementary students describing what they saw and heard. I saw the death toll counts roll across the screen. I've read friend after friend's comment about it online today. But I still haven't had the words to say for myself. I still haven't known what to say. It's horrifying, to send your baby to school, at Christmastime no less, and to not see them come home a the end of the day. My hard week with little E seems a lot less horrible now. My frustration with her, annoyances, along with the aches and pains of pregnancy I've been experiencing lately, really don't seem that bad. I was even going to post something on social media this morning, expressing my frustrations with my way-to-adventurous daughter. But then it really didn't seem to matter. It seemed so trivial to mention that things my daughter has destroyed today, including my computer. It seemed silly to gripe about her week of terrible twos, and how badly I want the hubby to come come from his class tomorrow. Because the fact of the matter is that I wouldn't change it for anything. I would take my little girl, with her horrible tantrums, over any other reality. My friend said it best. It was evil. Evil that showed itself today. Evil that killed innocent children and the teachers trying to protect them. I don't think fingers can be pointed besides that. The only remedy is Jesus. Oh how I pray that the people in the midst of this tragedy know Jesus. Because oh how they're going to need to lean on Him in the coming days. Life without Him truly is hopeless and meaningless. "Come to Me, all you who are weary and burdened, and I will give you rest" (Matthew 11:28, HCSB). "He gives strength to the weary and strenthens the powerless" (Isaiah 40:29, HCSB). "God is our refuge and strength, a helper who is always found in times of trouble. Therefore we will not be afraid, though the earth trembles and the mountains topple into the depths of the seas" (Psalm 46: 1-2, HCSB). I'm so thankful for the few moments i"m getting away this morning. My friend and I have been trading babysitting as of late, which works out well for both of us. She gets a few hours to work on her photography, I get a few hours to write! Plus, our little girls get to play together, so it works out well with everyone. This morning, I was truly in need of a break. Not a break from parenting or chores, no, I was in need of a break from my brain. Yesterday, I received some strange news. News that I know is false. My heart knows this, my head even knows this, but still doubts start to creep in. It was just a test result. A result I know can't be correct. Just the same, my brain was going crazy last night. I was searching the internet for every possible scenario. I was starting to become paranoid about it all. I have an appointment to be re-tested for this strange thing, but it's not for over a month. How, my brain asks, will I last that long? Will I go crazy before then? Will I be able to stand the unknowns? The anxious part of my brain tells me that I can't. I can't make it more than a month with these unknowns. That's not the way I function. I'm too much of a worrier to be patient. But then God starts to intervene. He reminds me that Anxious Meg still has room to change and grow. Anxiety is something that doesn't have to own me. If I know that something is false, why should I drive myself crazy while I wait for different results? There's really no need to. Instead, I can rest in the blessed assurance of a Savior who knows me and knows the situation. He knows the results are false. I know it's false. So all I have to do is trust Him for different results. "Don’t worry about anything, but in everything, through prayer and petition with thanksgiving, let your requests be made known to God. And the peace of God, which surpasses every thought, will guard your hearts and minds in Christ Jesus" (Philippians 4:6-7, HCSB). Oh how I need my head and my heart guarded today. I don't want this unknown to drive me crazy. I truly want to rest in the wings of the one who owns me (Psalm 61:4). Have you ever felt that way? Have you ever had a test result, or a person, or a life circumstance tell you one thing, when you know that it's another? How do you deal with the unknowns? How do you grow through the situation? For me, it's definitely about trust. Trust, and letting go of any anxiety that tries to own me. I haven't shared the details of this strange test, but could you pray for me? Pray that things get worked out quickly, and that my trust remains up above. Is there anything I can pray for you today? I'd love to join you in bringing our requests, bit and small, to the throne of grace. Because prayer works, my friends. I am emotionally drained this evening. I’m definitely having trouble finding joy this week. This potty training has been rough. I know I just shared all of this with you, but it’s honestly still rough. Patience, joy, peace are hard to come by. I second-guess my actions, the way I’ve approached this whole thing. But, for a moment, I’m away from it all. My dear hubby has let me escape to a coffee shop for the evening. A much needed retreat. My soul needed this in so many ways. It’s quiet here. There’s coffee shop music playing. I was able to commandeer a spot by the fireplace; that, and the latte in my hand, makes this pure bliss. When I step out of the middle of a situation, I can often see things more clearly. Is this true for you as well? I can see my daughter’s joy in living. How she’s truly been enjoying the extra attention during this time. I can see her brain working hard, trying to figure out this concept of using the potty. I can see my own impatience, my own need to relax and let things come as they will. And I can see my own need to rest. To truly soak up this time apart, as short as it may be. There’s something funny about being here in a coffee shop. It reminds me of my grad school days, holing up in coffee shops for hours on end. Correcting papers, writing term papers and a thesis. It’s funny how priorities and time change people. Back then, I was on the brink of so many dreams. Since then, I’ve married, had a child, and moved half-way across the country. Yet, my writing is still here. A part of me is still fulfilled when I sit with a latte, a warm fire, and my laptop. And my dreams are still intact, they’ve just modified over time. Of course I’ve changed, but an integral part of what makes me, me is still the same. Words are still a part of who I am. They’re still how I express myself. How I pray. How I discern. They’re how I piece together this life. Words, and prayer. Yes, I definitely need to be doing some praying tonight. Sorting through all the emotions I’ve been feeling lately. Asking God what He wants to teach me through this whole process. As I think, and pray about it, the resounding theme for this evening is perseverance. Staying on the task. Looking toward the ultimate goal. It’s easy to get caught up in everything that is or isn’t going right, instead of looking ahead. “Be strong and courageous, all you who put your hope in the Lord” (Psalm 31:24, HCSB). “So we must not get tired of doing good, for we will reap at the proper time if we don’t give up. Therefore, as we have opportunity, we must work for the good of all, especially for those who belong to the household of faith” (Galatians 6:9-10, HCSB). I am my daughter’s cheerleader, I always will be. It’s my job to be her advocate, her encourager. To help her succeed. Yes, it’s tiring at times, just as this life as a whole is, but my God will sustain me today, and everyday. I’m truly thankful for this evening apart. This perspective. This chance to think, to write, to look at the bigger picture. It’s so easy to get downtrodden, to get discouraged, to forget to let Jesus take the reigns, even with something as seemingly miniscule as potty training. This is my chance to let go, and let God work over the next few days. Who knows what He’ll do. Lord Jesus, help me to persevere over the next few days. Give me joy and peace in what ever I may face. Help me to live my life for you, so that my daughter can see your love. Encourage my little girl in this new endeavor, I’m sure she needs it. Give us both the patience we need to figure this thing out. "Let us go to His dwelling place; let us worship at His footstool" (Psalm 132:7, HCSB). "Six days before the Passover, Jesus came to Bethany where Lazarus was, the one Jesus had raised from the dead. So they gave a dinner for Him there; Martha was serving them, and Lazarus was one of those reclining at the table with Him. Then Mary took a pound of fragrant oil—pure and expensive nard—anointed Jesus’ feet, and wiped His feet with her hair. So the house was filled with the fragrance of the oil" (John 12:1-3, HCSB). I find that life is extremely busy, as of late. It's rare for me to have a day that we don't leave the house for some reason. Our days are filled with couponing (our newest hobby! ), play groups, coffee dates, a book study/Bible study, workouts, bread baking and house cleaning. Little E usually takes a two hour nap in the afternoon, but even that is a battle some days. Her nap time is usually my time to get things done around the house, serf the internet, or take a nap myself. I'm truly tired by the end of the day! I love our busy life, but I usually don't have much time for myself. And that time I have, I don't always spend wisely. At one point, I remember being extremely overwhelmed about life. I don't remember who spoke to me, but someone wise pointed out that worship is a matter of living. We don't have to beat ourselves up about the time we do or don't spend with Jesus each day. Sometimes I think that life of a nun sounds quite marvelous, they can spend all day worshipping God, without outside restraints. But that is not my life. God has blessed me with this beautiful family, so, I believe it's my job to worship Him with what I have. Worshipping Him with the moments. Giving thanks for the picture perfect scenery I wake up to, early morning devotional times with a cup of coffee in hand, a cuddly little girl who loves to read books, this is my life. I do my best to start each day right, so that I can worship God with each day I've been given. The words I speak, the thoughts i put in my head, the music I sing, all of it brings glory to God (I hope!). In the book of John, Mary anoints Jesus' feet with oil. She then wipes His feet with her hair. It's such a beautiful sign of adoration. She truly loves her Savior, and is demonstrating it to Him in a feasible way. She's worshipping Him with her life. Yes, some would ridicule her for the act, but she really didn't care. All that mattered was her worshipping Jesus. I want that to be my attitude as well. I truly want to live each day, worshipping Christ, and not caring what the rest of the world thinks. I want to anoint His feat each day. Submit to His plan, His way. Live my life for Him. What does worship look like to you? Last Tuesday I introduced Little E to Cinderella. She's been fascinated with it ever since. In fact, we've watched the movie two more times since then. Little E loves everything about the movie. The singing, the dancing, the characters. She was especially fascinated by Cinderella. She wanted her to be center stage. If the scene didn't include Cinderella, E wanted me to fast forward until she was present again. Already, she wants to be a princess. Rags to Riches. A nobody to a somebody. A rag girl to a princess. Don't we all have a similar dream? We all want to be recognized for the princesses we are. We look at the injustices around us, and long for something better. We wonder when our prince will finally come and save us from our tedious life. There are several directions I could take this post. To be honest, I've wavered back and forth. I could talk about unrealistic expectations, and how romances and fairytales only set us up for disappointments in this life. It's true, I've been there. Books can be an amazing thing, but they can also be a detriment, if we live too much of our life in make-believe. Or, I could go a different direction, and talk about the princesses we all are in God's eyes. How He sees us as truly beautiful and worthy in His eyes. All of those are good points, things I've read before in blogs and books. Or, I could just write about the wonder of children. I love watching an entire world open up to my daughter. Each day is new and full of excitement. When she watched Cinderella, it was truly her first experience with a princess. An entire world of make believe is opening up to her. I can't wait to see where her imagination will take her in future years. Hopefully she'll love movies, books and blogging. Maybe she'll be a great writer, or teacher or artist. It's amazing to know that her life is truly only beginning, and I have the privilege of watching it unfold. I get to watch her eyes open with wonder as she learns something new. What an incredible blessing! I hope and pray her imagination serves her well. That she uses the gifts God has given her for the good. And that she does have an awareness of the beautiful princess she will always be in God's eyes. "For it was You who created my inward parts; You knit me together in my mother’s womb. I will praise You because I have been remarkably and wonderfully made. Your works are wonderful, and I know this very well" (Psalm 139:13-14, HCSB). “Rest in God alone, my soul, for my hope comes from Him. He alone is my rock and my salvation, my stronghold; I will not be shaken. My salvation and glory depend on God, my strong rock. My refuge is in God. Trust in Him at all times, you people; pour out your hearts before Him. God is our refuge” (Psalm 62:5-8, HCSB). My daughter was born here. Here we prepared a room, waiting for her arrival. Here we brought her home, and survived those first few months off sleeplessness. Here we’ve celebrated holidays, birthdays, anniversaries. Here we’ve made friends, invested in others, participated in a church. But it’s not permanent. No, I’ve already watched many dear friends move onto other duty stations. Sometimes I get anxious when I think of everything else we still have to do. There’s so many places left to see, so much to do. Sometimes I dread the goodbyes, leaving this house, and the people of this town behind. Sometimes the thought of once again packing up our life and starting over seems a little too much for me. I'd rather stay in one place, and fully put down roots. But, there’s a part of me that loves the excitement, the change, the unknown. A part of me feels unsettled, even now. I’m ready to move on. I know that this current place isn’t permanent. I’m ready to see what’s next, around the corner. But I also know that moves really don’t get easier. Change is always hard. And now we have a child in the mix, a child who will probably be confused by future moves. Change she’s never experienced. At the age of 2, this is the only home she’s ever known. Will she even remember her first home? Yes, military life is exciting, but it’s certainly hard as well. Lord give us flexibility. Lord give our family that ability to pick up and move. Give us hearts that mold to your plan. Help us to teach our daughter about change. Help her to adjust easily, every time we move. May it only make her stronger, more independent, more willing to rely on you. Thank you for being our rock today and every day. While homes and states and countries may change, we will always find security in you. "My help comes from the LORD, the Maker of heaven and earth. He will not allow your foot to slip; your Protector will not slumber" (Psalm 121:2-3, HCSB). Here I am, babysitter for the evening. The kiddo was asleep before I even arrived, so my job is more that of house-sitter and overall protector. Pretty easy, if you ask me. Just the same, this child needs looking after. She's young enough that she can't be left alone, while her parents go out on a date. While my role may be a minimal one, I'm still there, protecting her as she sleeps. There are times when we forget that God is watching out for us. Times that we forget His overarching, comforting hand. He's there, when we drive our car down the road, when we travel cross country in a plane, when we lay our head down to rest at night. He's protecting us. His angels stand guard over us, protecting our every footstep. "For He will give His angels orders concerning you, to protect you in all your ways" (Psalm 91:11, HCSB). In an imperfect world, full of sickness and disasters, it's sometimes hard to see our Protector's hands. But then, I start to wonder, how many times I have been spared. How many times I chose not to go somewhere, slammed the brakes just in time, or recovered from an illness, all because my Protector deemed it so. There is something greater at work, my friends. Someone greater who protects us, each and every day. May you feel His protection today and everyday. May He open your eyes to the ways He moves and protects, even when you are unaware. May you hide in the shelter of His wings. "I will live in Your tent forever and take refuge under the shelter of your wings" (Psalm 61:4, HCSB). Life is beautiful with the hubby back home. It truly is. Things are starting to get back into an order and system (or perhaps a new system has been put in place, can we really ever go back to the way thing were?). My daughter has already adjusted to the warmer weather. When it's daylight her shoes are on, her hat is in place, and she expects us to go outside and play. Most of the time I humor her. There's little more pleasant than browned shoulders, cute sunhats and laughter. But sometimes, I say no. I explain that there are things to do such as dishes, laundry and/or grocery shopping. And then the fits begin. Not just tiny ones, but full blown crying, screaming and throwing herself upon the ground. I've tried different tactics at this point. Little seems to work besides pulling her to the center of the room and letting her sit there and wail until it passes. I don't humor her. I don't condone the behavior. I just wait until she's had her say. In those moments my baby truly acts almost two. The emotions, the actions, the words "no, no, no," all exhibit symptoms of a baby who's slowly growing up. Slowly realizing that she can't always have her way. It's a tough lesson to learn. One I know I've written out before on this blog. Those Almost Two Days are tough on Little E and her momma. By the end of a tantrum we both feel mentally and emotionally drained. We're both ready for a break. Even this morning, I still feel tired. Almost Two Days can truly wear a woman out. "He lets me lie down in green pastures; He leads me beside quiet waters. He renews my life; He leads me along the right paths for His name’s sake" (Psalm 23:2-3, HCSB). An unexpected nap from Little E, brought on from her first tantrum of the day, have given me some quiet time. Time to devote. Time to pray. Time to write. Time to refresh. Because I want to be a good mother. A good wife. A good friend. To do that, I need times of quiet. Times of restoration. Times to remember that this path of motherhood is one God is leading me down, each and every day. Do you need restoration today? What verses do you turn to for encouragement and strength? I have trouble concentrating. I’m anxious. I’m extremely excited. I’m in a tizzy as I try to get everything done on time. I have trouble sleeping. It does kind of remind me of being a senior in high school, ha! Only this time, I’m waiting for my husband to come home. I’m excited, and nervous, about having him back in our every day lives. Oh how wonderful it will be. But, oh, what an adjustment we have in front of us. Just as this deployment was a new situation for us, a homecoming will be new as well. I’m sure we’ll have our own, interesting challenges awaiting us. My husband will be drastically changing his time zones. He’ll have to adjust back to having a little one underfoot. He’ll, really, have to get to know our daughter all over again. She’s changed so much since he’s been away. He’ll have to adjust back to America, the land of plenty, with everything you can think about at your finger tips. It’s hard to imagine what it will be like. As for me, I’m so extremely excited to have him home again. I’m busy fixing up our house, running errands, making lists of meals I want to cook, dreaming up family vacations for us to go on this summer, and looking forward to some dates with my hubby! As my days are focused on the up-and-coming homecoming, I can’t help but think of my Jesus. Oh, how happy He must be for us now! And, oh, how he wants this same response from me. Do I anticipate spending time with Him everyday? Do I make myself look nice, when I come into His present? Do I wait expectantly for Him, in every part of my life? It’s certainly some food for thought. “How sweet are your words to my taste, sweeter than honey to my mouth!” (Psalm 119:103, NIV).